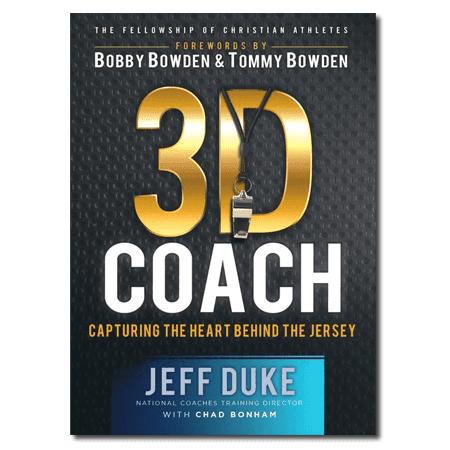 In 3D Coach, Dr. Jeff Duke of the 3D Institute shares his own journey through the three dimensions of coaching and how it has impacted his life and those around him. He also shares the personal stories of coaches from all levels who have implemented the 3D concept into their own programs. This book was written in partnership with FCA and includes faith-based references and stories. FCA is a level 3 partner of the 3D Institute. This book is a supplementary reading and does NOT directly correspond with the 3Dimensional Coaching Course for Certification. It is a resource unto itself. With more than 60 million athletes involved in sports in America, it is estimated that one coach will impact more people in one year than the average person does in a lifetime. Today’s coach could be one of the greatest authoritative figures in the life of today’s adolescent. So the question isn’t whether coaches leave a legacy, but rather, what will that legacy be? Current trending research shows that only 15% of coaches are intentional about coaching beyond the skills and strategies of the game (1st Dimension). A 3Dimensional Coach understands and harnesses the power of the coaching platform to coach the mind (2nd Dimension) and transform the heart (3rd Dimension). They can be the catalysts for internal transformation that guides both the coach and the athlete on a journey to finding purpose in our performance-based culture.